James, Martha and myself took advantage of the breezy brightness to go and check the Geocache we look after - Another Fine Ness, it's called, if you're into Global Positioning as it relates to treasure hunting. Imagine our astonishment to find that the cache had been visited in the dreadful weather of last Sunday (it's an hour's rough hike just to get there from the road end). I hope the Fisher family survived. 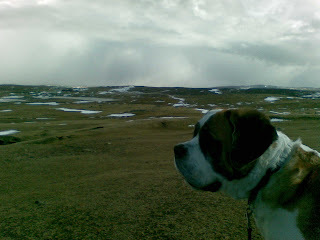 Took Lulu the St Bernard out for a walk this morning up at the Eshaness cliffs. 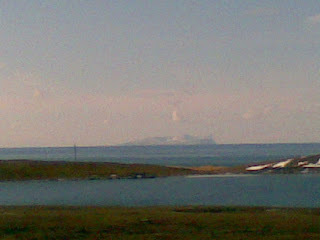 Ronnie was out checking his creels - that's his boat - and while it was glorious to the west (Foula can be seen, glinting in the distance) more snow showers were coming in from the north, and Ronnie was racing them back to harbour. The snow won't let go. But gradually, in the face of inexorable spring, it is loosening its grip. The Radiocroft is not looking its best at the moment. I'm toying with the idea of painting it country-cottage white, but I quite like the way it half-merges with the ground around it. Which sounds, I fear, a little like mid-period Logan Gonzago Mountstuart, protagonist of William Boyd's absolutely superb Any Human Heart:The Intimate Journals of Logan Mountstuart. I'm currently re-reading it, and this 20th-century-spanning tale of one man's complex, messy, name-dropping, tragi-comic life remains both comforting and disturbing. of non-existent American abstract expressionist Nat Tate. Complete with photograph. As if I don't have anything better to do! The Malt and Barley Revue's premiere is approaching rapidly, and I still can't play the ukulele properly. Yesterday's weather deteriorated during the programme until, at 4.00pm, I received a call from Susan to say she was stuck on what is known locally as 'The Footpath' - not a footpath at all but a steep road between Ollaberry and Ronas Voe. 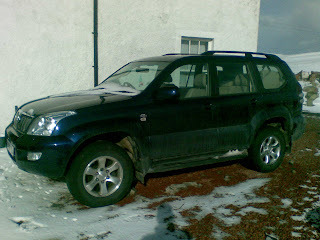 This despite her super-tough Landcruiser 4X4, which suffered the ignominy of being hauled out by, variously, a gritter lorry, a pick-up truck (probably a Toyota Hi-Lux, though possibly a Mitsubishi L200) and a tractor. She sends heartfelt thanks to all concerned. And is off to buy new tyres, her (legal, just) Dunlop AT20s clearly not being up to the job. As it happens, I had to drive all the way to Sumburgh Airport to pick up Magnus, who had flown in for the Easter holidays...that was a 130-mile round trip in frequently horrendous conditions, including a complete white-out at Levenwick. The Citroen C4 (new acquisition) was amazingly agile throughout, even in deep snow...that 1.6 diesel engine has the torque and the front wheel drive walks the walk. And new tyres probably helped. 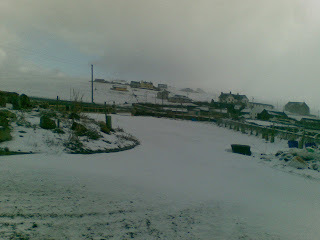 Back in Hillswick, so far the promised new downfall of heavy snow has not materialised, and the roads have been cleared, for the most part. Kilkerran the Connemara horse (AKA Crofty or Crafty) is a new addition to the local landscape and seems to be enjoying the conditions. 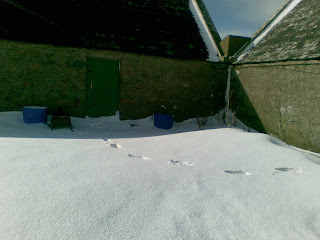 He's soon to be joined by a rescued Shetland pony, which is apparently knee-high to the smallest snow drift. 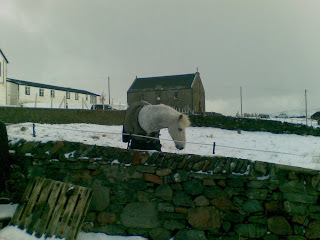 However, Shetland ponies can, in my experience, survive anything, including being hit by large four wheel drive vehicles. The ponies walk away, unconcerned for the most part. The 4X4s are usually write-offs. 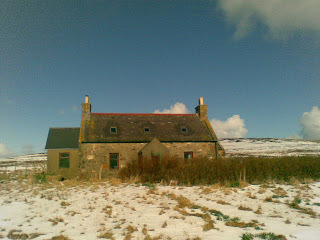 Winter at The Radiocroft. In spring. Easter Monday, and it's not just snowy, it's bitterly cold and very windy too. Still, so far the power's on and all the digital gubbins is working, so I'm fit to broadcast. Have to go into Lerwick later anyway, to pick up Magnus - he's flying north for the week from Glasgow - but if The Radiocroft is working, it's as well to use it. Just booking a holiday in Spain for July, and looking at pictures of the Costa Brava in searing summer, it's hard to believe in a world of gazpacho, tapas, Sardanas and San Miguel. But it exists! At least, I think it does. Anyway, this is the first real snow of the entire winter, and it's arrived just as spring begins. And for the first time I have a car which lacks snow tyres. Back home on a rather bumpy flight last night, with the weather deteriorating into a brutal cacophony of howling gusts by about 4.00am. 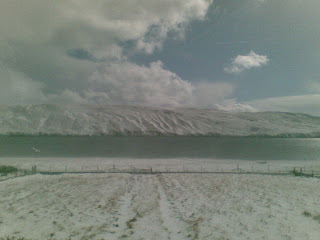 Also snow, hail and sleet, now with the occasional outburst of sunshine. 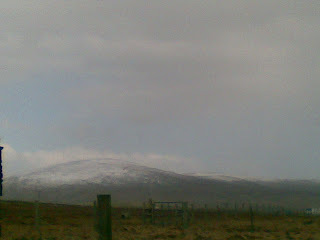 This is the view from behind The Radiocroft, looking up to Shetland's highest point, Ronas Hill. So far, all the technology for broadcasting seems to be working - just as well, as I don't fancy a pell-mell trip to Lerwick in these conditions. It's the Brae Up Helly Aa tonight, last fire festival of the year. Let's hope the weather improves. 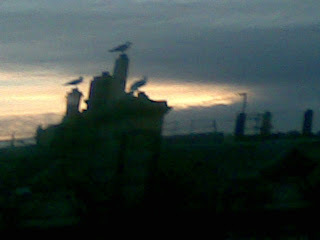 Why, I asked the taxi driver, was there always a wee flock of black cabs parked up behind the Pond Hotel, next to Gartnavel Hospital in Glasgow? "Those are the Blood Taxis" he said. Seems the blood bank at Gartnavel provides emergency blood supplies for much of southern Scotland, and the favoured mode of transport is black cab. 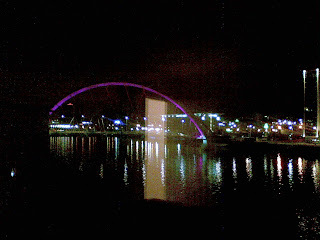 "All over Glasgow, and much further too" said my driver. "Fife, Kilmarnock." They don't JUST handle blood, obviously. They do flesh AND blood, so if you're staying The Pond and phone for a cab, it's usually there in approximately 30 seconds. 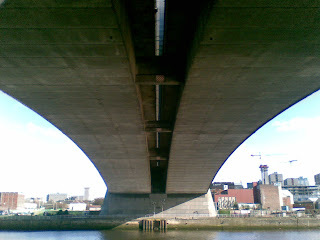 This is the bridge from Finnieston (Minerva Street) over the Clydeside Expressway and the railway to the SECC and thence over the river to the BBC. The red bit is supposed to be for walkers, the green bit for bikes. 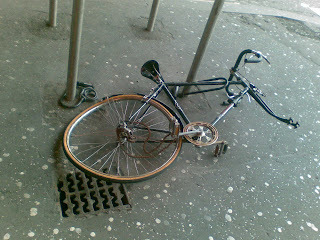 Pedestrians ALWAYS ignore the painted bicycles and appear shocked that they have to get out of the way when velocipedes bear down on them. But they only shout if you hit them. 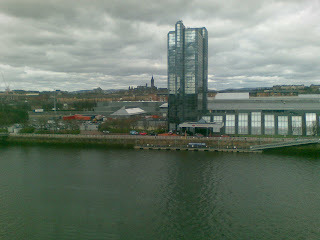 Looking down at the River Clyde from the third floor of the BBC building at Pacific Quay is a vertigenous business. Looking over the river towards the university (my alma mater: that's it with the rocket-like gothic spire) is fairly disturbing, in that such a view would have been impossible back in 1973, when I first came to the city as a student. Unless I'd climbed up a crane. In 1962 we moved to Troon, and 11 years later I came to Glasgow to study. There was no Clyde Walkway in 1973, there were still puffers (small coastal cargo steamships) on the river, and bigger boats too. On Hogmanay, at midnight, you could still throw open your windows and hear the ship's whistles howling. Then, the river was still hemmed in by warehouses and shipyards. Now it's all private housing (much of it plummeting in value), hotels and offices, the Scottish Exhibition and Conference Centre. Ships don't come up as far as Pacific Quay, which used to be Plantation Quay. Cargo and passengers used to depart from here to the West Indies. the river was so dirty, awash with raw sewage and chemical waste, nothing surivived in it. Nostalgia? Looking out past the Crowne Plaza Hotel to the university, there is that. But there are salmon in the river now, and capuccino in the cafes. Arrived in Glasgow last night and walked from Queen Street to the West End. For some reason I've always found walking about cities more interesting than perambulating in the countryside...and cycling even more so. Well, perhaps 'interesting' is the wrong word. 'Frightening' might be better. Who needs computer games or roller coasters when you can dice with buses along Dumbarton Road? Actually, the 20p per tyre charge was waived, though I did get a lecture on under-inflation and having a bit of string tied around the frame ('have you just ASSEMBLED this?'). It was all a bit like the old days of dealing with intimidating sales assistants in music shops - the ones who would let you try out a guitar and then demonstrate their blistering prowess by playing Steve Howe's The Clap at double speed. Until punk wiped the smiles from their faces. And the mercury from their fingertips. 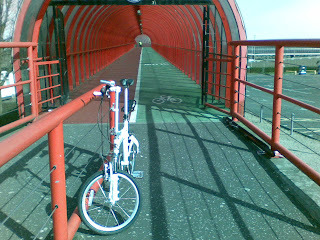 Over to Beeb HQ at Pacific Quay, which involves the aforementioned Dumbarton Road thrill ride, before the excellent traffic-free bike-and-pedestrian route from Finniston. West End to PQ is definitely quickest by bike. Both Susan and myself have been really moved by the tremendous outpouring of support and reassurance over the 'phone, by email and on this blog. Thanks a million. 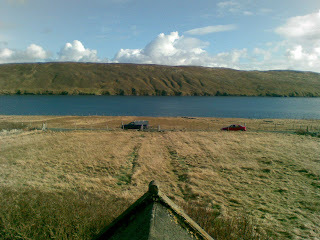 It's been a beautiful day here in Shetland - mild, sunny and for the first time in months Susan had a Saturday off. 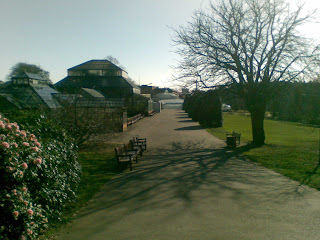 So it was great to do that Olive Tree/Hay's Dock thing (see posts below), and get a bit of a walk. Hopefully a line has been drawn under this whole strange and ridiculous business. I'm off to Glasgow tomorrow for a few days of meetings, courses and curries. Hell's teeth. Not, alas, the end of the story after all. When I posted yesterday's blog I had no idea that some benighted individual had sent letters and emails to The Sun newsdesk, making even more salacious and bizarre allegations about my private life. Or that a reporter and photographer were already on their way north. By the time they arrived in Hillswick they were absolutely convinced there was nothing to the information they'd been given. However, the paper decided that the campaign of malicious gossip against me was itself enough of a story. What can you do? As I said to Gordon Tait from The Sun yesterday, when I was a hack 'doorstepping' people in search of a story was a way of life. I never expected it to happen to me. Though I have to say that both Gordon and his photographer were polite, professional and sympathetic. The whole thing remains a very distressing experience, though. I spoke to the police last night, and they are investigating the whole business. Once anonymous letters and emails are being sent, the matter is a technical breach of the peace and criminal proceedings against those spreading the false rumours can be taken. Meanwhile, the guys from The Sun are still on the island, tracking down anyone they suspect may have started these rumours. Which, just in case you're starting to wonder, are utterly fictitious. 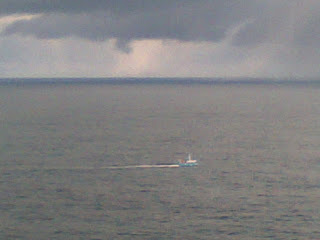 I still love Shetland. I'm aware that as a minor 'celebrity' I'm an open target for idle chit-chat. But what upsets me, as I said yesterday, is the fact that islanders I have trusted and respected have quite consciously and in some cases gleefully spread lies about me and my family. Shame on them. The thing about living in a small (22,000 people) island community is that your life is not your own. You are on display, visible - this is a bare, stark landscape in which every household and most cars come equipped with binoculars. And your whole life is likely to be the subject of scrutiny and speculation. Especially if you live semi-publically. As broadcasters and writers inevitably do. 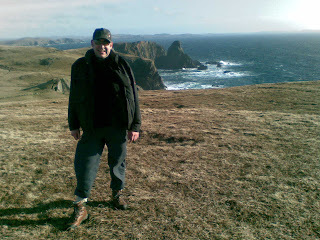 However, in the 20 years or so I have lived in Shetland, I have never been subject to the sustained, unfounded, very personal and utterly malicious campaign of rumour and innuendo that has apparently been going on for the past while. Neither myself nor Susan knew anything about it until last week, when one colleague decided enough was enough and he was going to tell me what was being said. It turned out to be a whole swathe of lies, about me but aimed, we think, at damaging Susan and our family generally. It was fairly easy to trace the source. But what to do about it? Silence? Ignore it all? A few enquiries to friends revealed that they had all heard the stories, but had (and this is a Shetland community survival technique, I think) decided not to say anything. I do not think detailing the tales here would be helpful. Suffice to say that those responsible for starting this should be aware that they are dealing in lies, and that such antics illustrate their utter moral bankruptcy, and the contemptible state of their imaginations. As a journalist, of course, I always argued that gossip is the first draft of news, which is in turn the first rough draft of history. But gossip only becomes news when it is checked factually. Nobody did so with these nasty stories. And can I just say this: repeating them as 'ridiculous' is just playing into the hands of their malicious orginators. If I open the Velux window above my head and poke my mobile phone through it, this is the picture that results. Well, it did just a couple of minutes ago! The Radiocroft is looking fairly grim today, as the nasty weather that has been battering the south of England and Wales begins to give us a pasting here in the Zetlandic Archipelago. Bit of a kerfuffle at 1.00pm when we tested the ISDN connection with a view to going back on air from Hillswick this afternoon. It took four attempts before everything locked up and Aberdeen and myself were on speaking terms. We sorted it at last, so it's all systems (sort of) go for 2.05pm! Speak soon! Following the disastrous breakfasting experience of Kenny and Bruce (see below)I'm pleased to tell you that excellent petit dejeuner action can be found in Lerwick. The Peerie Shop Cafe is usually reliable, though there have been some truly bizarre burnt-muffin moments recently and the staff's lack of cheeriness remains astonishing to those not used to The Shetlandic Way of Glum Servitude. Anyway. It's shut for refurbishment and smile training. The Havly Norwegian (Christian) cafe is also closed, which means the strongest coffee in the northern hemisphere (guaranteed to induce palpitations)is unavailable. Always feel uneasy in there reading The Guardian's more louche G2 stories. Harbour Cafe is fine if you want grease (double egg and chips can be superb) Faerdie Maet is good for toasties but has very strange cakes and Osla's is out on principle. The Skipidock is fine if you're in the mood for chips, The Fort is where you get stunning fish with your chips (they change their fat more often than any chip shop I've ever encountered) but it's always full. I went to the Olive Tree this morning, though, in the Toll Clock shopping centre. Excellent. Bo and Henry have worked wonders on the the layout and service, you can get Ian Mellis cheeses, very good coffee and there's enough space. Plus the freshly-baked scones were exceptional. 'Are you only here because the Peerie Shop is closed?' asked Cath. Nope. 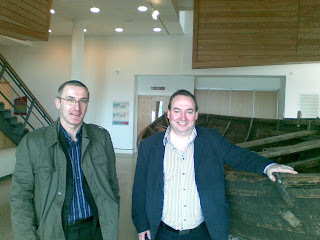 I think it's fair to say, though, that Kenny and Bruce were VERY impressed with the new museum, which co-incidentally is being judged this weekend by a committee of the great and the good (led by erstwhile doyenne of Radio Four's Today, Sue McGregor) for the Art Fund Prize. Presumably Sue will be staying somewhere which has the resources to obtain bacon in the mornings. But don't despair if you're coming to Shetland and think you may, at times, be hungry: Mike's seafood chowder at the Hay's Dock Cafe was predictably brilliant on Friday. But booking is obviously essential for lunch. ...six months before it's fixed, states A Taxi Driver. ...as played on today's show! Good news! We've been told that the Scottish government is to consider changes to crofting law which could put an end to uncontrolled wandering of the lanolin-soaked disease carriers. Also, thanks to Jimmy C for pointing out that the upper limit for the Small Claims Court in Scotland is now £3000. Which might just about pay for the eaten trees and the chewed bulbs. And ammunition for the shotgun. In Shetland they're disease-ridden, enormously destructive, almost valueless, stupidly romanticised subsidy objects, and if it wasn't for the ramifications I'd have been out this morning already with the .20 gauge terminating the ones that have destroyed our trees, bulbs and grass. Despite the cattle grid installed at enormous expense. We found out this week that the ecoli-0157 infested creatures which have all but ruined the township of Hillswick with shite and chewing are not subject to normal environmental health rulings, because of old crofting laws on grazing. This despite the fact that the single crofter who deliberately allows his sheep to stray has no grazing rights in this township. The sheep simply wander along the road, eating the verges (that's the idea - saves on winter feed) and causing traffic accidents. But, hey, that's the charming rural idyll! We know they spread disease, too. But the only way to stop them - and they have wrecked the lawns of the local hotel, too - is, it seems, to take the owners through the small claims court for every single piece of damage. Either that or change the redundant and unsafe crofting laws - but given the sentiment surrounding what has become for some a ruthlessly systematic form of subsidy jugglingm that seems unlikely. The courts have proved successful elsewhere in Shetland, so that's they way forward. Either that or I'll mount a Mad Max-style set of spikes on the front of the Torslanda and hunt the woolly bastards down one by one. Fair play to BT, or British Telecom...one on-line reporting of a fault at The Radiocroft, and within an hour or so an engineer - Ross - was in the exchange re-setting the ISDN card...another lightning strike suspected; everything is now fixed and The Radiocroft is back online, with broadband due for installation tomorrow. I feel sorry for the local BT engineers, who respond like lightning to...well. Lightning strikes that fry the Hillswick telephone exchange. But over the past five weeks, my ISDN (Integrated Systems Digital Network) line has melted down no less than four times, all but once sending my daily radio show into a disastrous tailspin and necessitating a mad dash by car into Lerwick. Twice we've lost chunks of the show, on Friday (after just travelling all the way from Aberdeen) the entire first hour. And it cannot go on. Psychologically and emotionally, the unreliability has wreaked havoc on me, my producers and my engineers. So, reluctantly, I've abandoned thousands of pounds worth of equipment and begun what looks like a long period of daily travelling to and from the BBC studios in Lerwick to do the programme. True, there are advantages: there are people at BBC Radio Shetland to talk to, there are newspapers to buy and coffee shops to visit. But the peat-fired cosiness of The Radiocroft, reached by bicycle or on foot from home, is no more. Perhaps it was always too good to last. 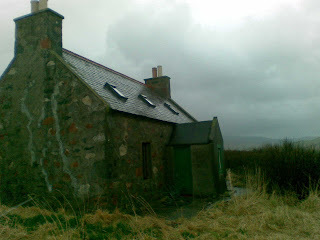 But with BT pushing the notion of homeworking and the future availability of broadband for audio broadcasting looking attractive, it seems a shame that after five years of successful Radiocrofting it should all fall apart so suddenly. What on earth is wrong?